Written by Carole J. Starr, M.S. 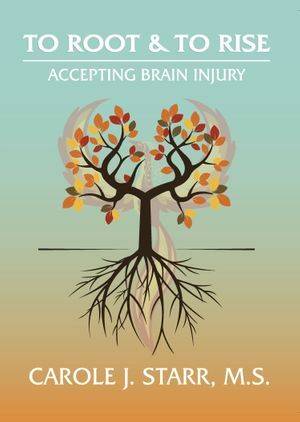 Accepting a changed new life is one of the greatest challenges brain injury survivors face. It’s also one of the most important. Coming to terms with brain injury can mean the difference between a mournful life spent looking backward and a meaningful life spent moving forward. In this book, long-term brain injury survivor Carole Starr mines her own acceptance journey for nuggets of wisdom to help others. Each chapter contains numerous strategies survivors can use. You’ll learn how Carole went from being uprooted by brain injury, to putting down new roots, to rising into a changed life and finding a way to soar. This book is more than the story of one survivor accepting brain injury. It’s also a workbook that readers can use to apply the strategies to their own brain injury journeys. The opportunity to think, write and talk about one’s own experience makes this book a powerful resource. Carole Starr’s life changed forever in 1999, when she sustained a brain injury in a car accident. She was unable to continue her life as a teacher and amateur musician. It took Carole many years to accept her brain injury and the new person she became. She’s reinvented herself by focusing on what she can do. She’s now an inspiring keynote speaker and the founder and facilitator of Brain Injury Voices, an award-winning survivor education, advocacy and peer mentoring volunteer group.